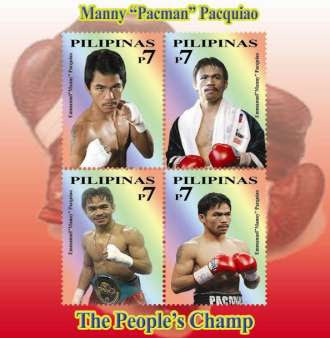 In line with the People's Champ's success in helping reclaim international respect for the Philippines through his boxing prowess, the Philippine Postal Corporation (PhilPost) will be issuing Manny Pacquiao Philippine postage stamps which will be released on limited edition collectors' item quantities. Pacquiao will be the first Filipino athlete to be immortalized in a Philippine stamp and be given such an honor by the PhilPost. This will also pioneer the "Kaya ng Pinoy" project of PhilPost which will feature a series of exceptional issues covering Filipino success in sports and the arts.